We had decided to make today a lazy day and I successfully achieved this aim by not even waking up until 8.40. I had my breakfast and pottered around, eventually disturbing the sleeping Peanut with a cup of tea at 9.30. A bit of a read in bed, more tea and it was 11.30 before you could wink. 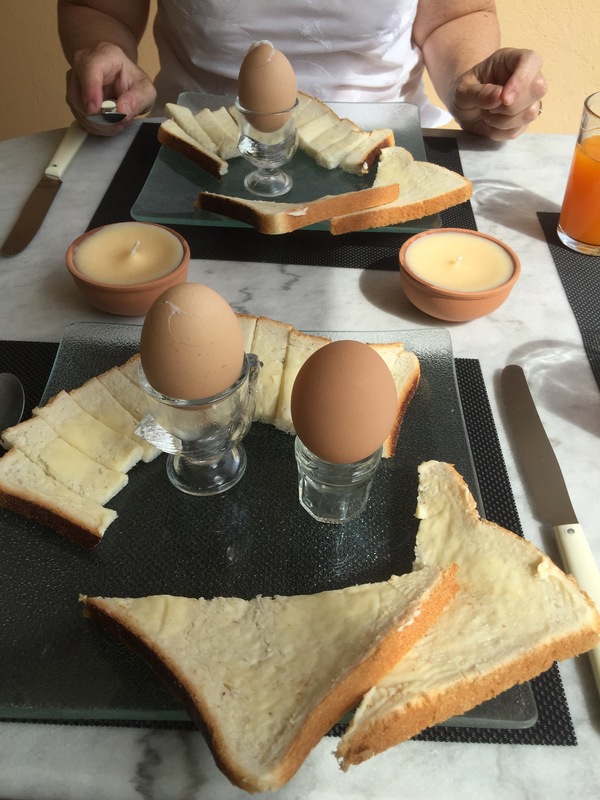 Reluctantly we surfaced and got ready for our main breakfast of boiled eggs and soldiers – very French I know. Once dressed and ready we went for an explore to Marines de Gassin where we had planned to have a light lunch. We have fallen foul of French Sunday lunch times before and knew we had to be a bit prompt or they would be finished, but our first choice of Vietnamese was “termine” at 1.30 which we thought was a bit harsh. C’est la vie. So on to another, this time Italian. Peanut had decided that as she had not long had her breakfast she would be brave and try something unusual for her meal, choosing a salmon and mango tartare with salad. She imagined it would be dressed with something inspiring, minced to perfection and waken her jaded taste buds. When I asked her if it was nice her answer was simple but to the point. No. It was chunks of raw salmon mixed with chunks of mango and some sad lettuce. 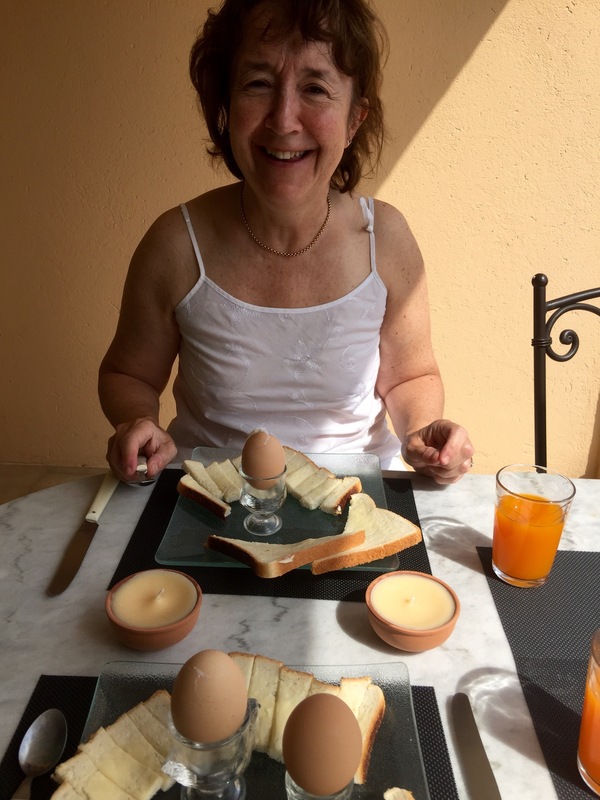 French food is not always what you would like it to be and in this case it was as much as she could do to eat it. I had a linguini carbonara which was ok but if I am honest would have been so much better 10 degrees warmer. 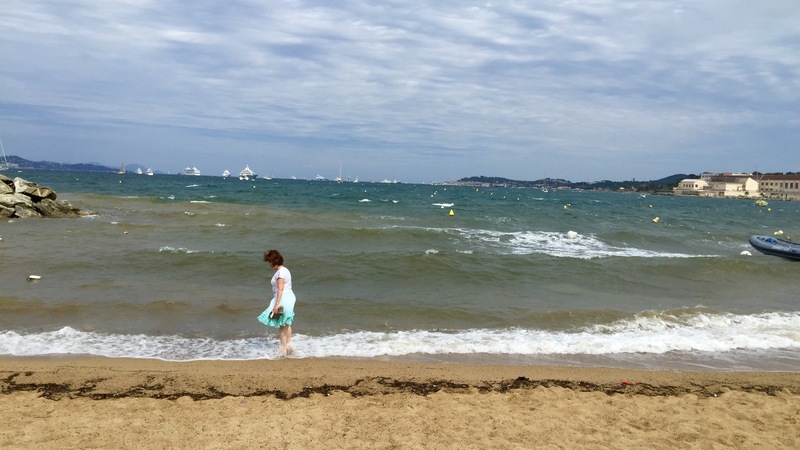 But we had some wine to wash it down and it was warm and pleasant so we just sat back and enjoyed the day and Peanut quickly dipped her toe in the sea. Walking back it became cloudier and more windy and it seemed likely that last night’s rain would return soon, which it did but only much later and by then we were snug inside reading, drinking tea, eating chocolate biscuits and being generally idle. Afternoon tea merged into dinner and we did one of our salad specials. A ring of tomatoes and eggs trapping a dressed salad that has had croutons, cheese cubes and lardons added. Finally a goats’ cheese parcel wrapped in super thin bacon and fried to delicious delight were served atop the salad. Cake and coffee for dessert and it was delicious. The rain returned again with a vengeance in the evening as we reflected on our day as we listened to the thunder and the lashing rain on the terrasse. We had achieved our aim of decadent laziness and with the exception of getting our evening meal, done very little. Perfect result. 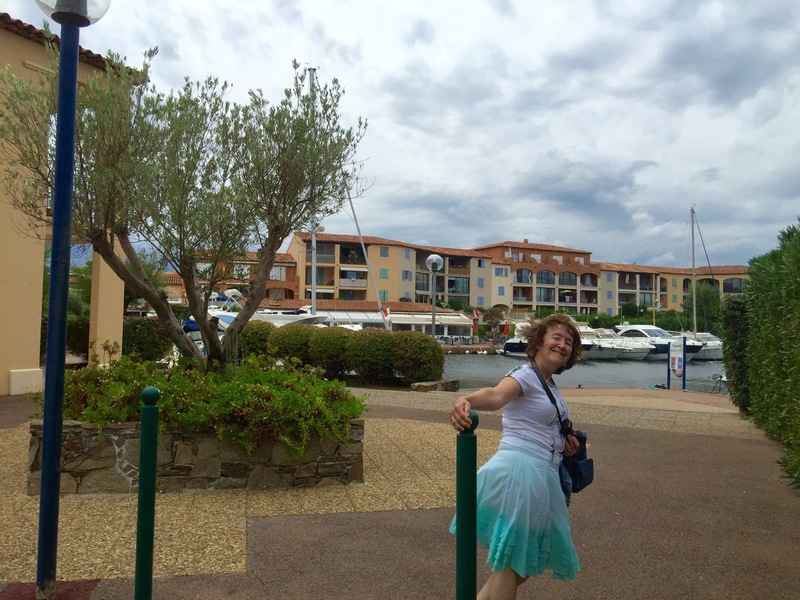 Categories: France, France and Italy August 2015, iPhone, Travel | Tags: france | Permalink. I love that photo of Peanut! She looks like she has not a care in the world. Thanks Loisajay. Peanut is s brave girl who faces up to tough things with a brave smile.